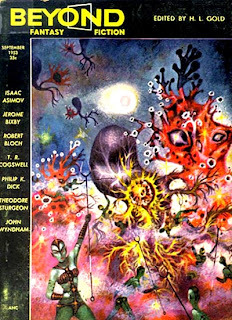 · Street Scene [“Dunderbird”] · Harlan Ellison & Keith Laumer · ss Galaxy Jan ’69; this story has two different endings. The version with the Ellison ending was in Galaxy, the version with the Laumer ending was in Adam Mar ’69 as “Street Scene”. There are certain books which will change your life, though usually only very slightly. This was one of those for me, an a young reader, which more than any other early reading experience brought home the sense of a writer's life and the community of writers. It's available as an e-book, which is the source of the link to the introduction, but I read the Pyramid edition with the Leo and Diane Dillon cover design pictured here, part of the series they did of Ellison paperbacks for the publisher (some reissued by Jove after the purchase). This is almost certainly the only version of an Ellison book to be blurbed with the employment of Jimmie Walker's mid-'70s catchphrase. The stories here, in what was the first collection of collaborations between one writer and several others that Ellison was aware of (I think there was at least one previous example, but it eludes me at the moment), are a mixed lot (and include a series of cartoons with William Rotsler which struck me as Just OK even when I was ten, not Rotsler's best work in the form, certainly--though I'm still fond of Fay Wray in the clutches of the big ape as he scales the Empire State, and someone shouting up from below, "Trip him, Fay!"). Even the best of them are almost invariably not quite up to the best of either collaborator, but they do have a special flavor...even when, as with the the two stories by Robert Bloch and Harlan Ellison individually, the collaboration is more along the lines of nudging inspiration...resulting in a decent Bloch story, since his was merely commissioned for Dangerous Visions, and a rather better sequel to that story by Ellison, who was mildly obsessed with what he was asking Bloch to do (both stories being sequels to Bloch's early story "Yours Truly, Jack the Ripper," one of those stories which follow their creators around for their entire careers, and one of the most widely plagiarized stories written in the last century). The antic comedies, such as the Laumer and Davidson collaborations, are often more successful than the attempts at more serious work, but the darker humor of the Sheckley and Silverberg stories are certainly effective. And, of course, while I'd read a few Davidson stories before this book (in anthologies attributed to Hitchcock), this was the first opportunity I had to read Davidson's delightful nonfiction, in this case an acocunt of an incident that Ellison also recounts, and the comparison of the two versions is telling and extremely entertaining. And the Bova story, "Brillo," was even ripped off for at least two tv series, though only actionably for one. Still a valuable read, and the ancillary material might be Ellison at his best at this, at which he is one of the best. For more "Forgotten" Books, please see Patti Abbott's blog, though updates will be delayed while she Shakespeares. Haven't found an image for this one yet, and my computer's down, so can't scan in my copy's cover. 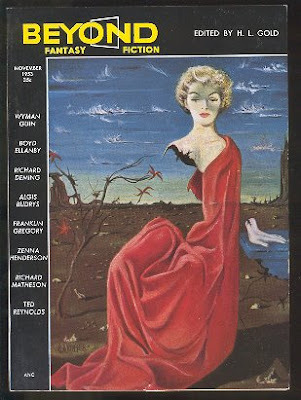 It'a a reasonable, if blah, cover, for a slightly unusual production for 1958 of a first publication in "oversized" or "quality" paperback (to facilitate, says Lippincott, the wide distribution of this first novel at $1.50 a hit, when mass-market paperbacks were averaging 35c). Where this novel is remembered, it's remembered as a jazz novel, involving as it does a second-gen jazz musician, returned from his military service and ready, if somewhat tentatively, to throw himself into the late '50s jazz milieu, even if his swing-era father doesn't understand the post-bop music the protag plays and seeks to play better. (To remember that over the space of a week fifty years ago that both the Brubeck Quartert's Time Out and the Ornette Coleman Quartet's The Shape of Jazz to Come were released is to realize just how much ferment there was in the late '50s, even if the popular support, Time Out's sales notwithstanding, was not up to the levels of the '30s and '40s.) He gets into a doomed affair, he decides to medicate his pain, and generally resents not being dug where he's not. Very much in the mode of the misunderstood young man novel that you know the shape of even if you haven't read many (or perhaps even any), it is a reasonably good portrait of the music scene of its time, even if novelists ranging from Nelson Algren to Nat Hentoff have done similar work better. 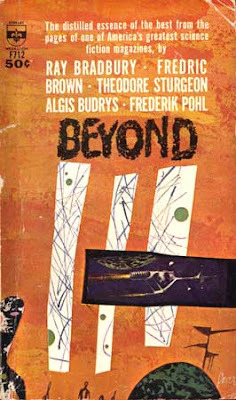 A good if unextraordinary book, and still, I think, the only anthology drawn exclusively from Beyond's inventory, which is criminal in and of itself. But, then, Fantastic's nearly thirty years of publishing is represented by two only slightly less obscure volumes, and they only slightly better representative of its best work. In bed with a woman happy to be there with me--a decent breeze through the windows never hurts. An utterly excellent library or bookstore--a decent breeze through the courtyyard never hurts. Auditing pleasant to brilliant performance by performers (not a recording of them). Sustain a passionate and/or mutually satisfying romantic relation for more than ten years. They can't be good enough to want to reread them? Tag Four People You Believe Will Respond. Always fun to assign your friends homework. 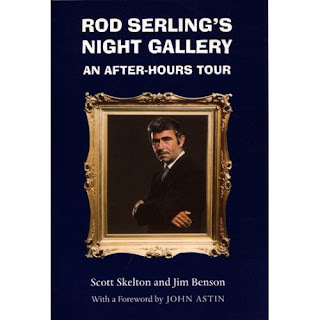 Rod Serling's Night Gallery: An After-Hours Tour is an example of why we can love university presses, even if the ridiculous list price (for this still barely in print volume) of $70 is an example of why we can be disappointed in them as well. This is a reasonably well-written and very well-researched (to the extent of my ability to nitpick) episode by episode and season by season breakdown of the production hassles and greater or lesser aspirations of a series that employed a unique range of talent, and often produced better results than memory might suggest (because so often, worse results were also produced, something the authors are not shy about noting). Serling, famously, lost what control he had of the series as it went forward, and turned to other projects, such as his five nights a week radio anthology Zero Hour, and such notable narration duties as for the National Geographic Specials spinoff series The Undersea World of Jacques Cousteau, and Universal TV producer Jack Laird (once called a "thug" by Harlan Ellison) tightened his grip on the production. Meanwhile, the employment of such major jazz musician/composers as Gil Melle (who was moving into exploring electronic music, as with the more memorable series theme) and John Lewis (of the Modern Jazz Quartet and a number of the films from the 1960s onward) is just one slightly surprising example of the caliber of artist working in support roles for the better and worse horror and suspense drama (the most famous Serling line about the series, particularly after the first season, was that it had become "Mannix in a shroud"--like that series, which had also started well, it had become a routine sort of product, at least too often). Aside from presenting several of the best realizations of H. P. Lovecraft's fiction in audiovisual media so far (if not quite the labors of love that some of more recent productions have been), the series was notable for having the good sense to adapt such major and notable writers as Fritz Leiber and Hal Dresner (in the first actual episode, after the pilot tv film), but odd casting in the adaptation of Leiber's "The Dead Man" weakened the impact there, and utterly inept reworking of the script on set (and a bad performance by a very young Diane Keaton) apparently were the resaons that "Room with a View" is so grindingly inept as presented. A not-bad, if watered down, adaptation of C. M. Kornbluth's "The Little Black Bag" was a part of the next episode. A fine book about an important series, if not by any means always a good series (however many of us remember fondly "The Earwig" and "They're Tearing Down Tim Reilly's Bar"). Please see Patti Abbott's blog for more Friday's "Forgotten" Books. It took a small freight truck to really smash the cake. A Jeep had clipped it, most of the cars had managed to get around it without touching it. Not being a jerk, he'd put the modest three-layer construct on the edge of the lane, and sat watching from the hillock just beyond the shoulder on the other side of the country highway. But he wanted to see it smashed, and now he had. Smashing it himself would seem like cheating, in at least two senses...he hadn't been responsible, not directly, for what happened to her, so why should he take it out completely on his own on the cake. And, of course, actually attacking the cake himself would also seem like an attack on the wedding, an attack on their union, on her. If he had any hostility toward her, it was only the resentment that she was gone...and he couldn't begin to resent her very much, so much as to want to, well, destroy the world. Better, instead, to passively destroy the overpriced cake that, of course, couldn't be returned nor cheerfully disposed with (hey, want some cake that she would've rubbed my face in?). Like most wedding cake, it wasn't even all that good. It had been pretty. He'd taken a bite of the top layer before solemnly setting it down just inside the white line on Rt. 43 West. You never really know which airplanes will crash. Nor when. Nor who will be aboard. Nor why you weren't on the flight with her, except for the petty bit of business that would've put him on the redeye the next morning...if it hadn't been moot by 7pm that evening. Or so he reflected, as he watched a sedan splatter some of the remains of the cake onto the shoulder. He decided he'd watch this for another hour...it'd be dark by then. He had no idea what he'd do then, but it didn't matter much, and probably wouldn't for a while.